Antique 19th century children’s dishes were designed to entertain or distract children during their meals, similar to today’s colorful restaurant menus provided to amuse and silence children in a crowded eating place. 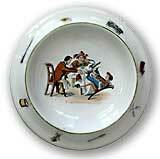 Children's antique dishes with molded borders and printed nursery scenes were popular during the nineteenth century. An ABC dish makes a great gift for a new mom. 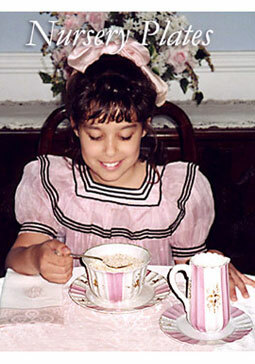 The picture of antique dishes above features an 1890s pink and white porridge set including a cereal bowl with matching plate and its own milk pitcher with matching nursery plate. Many antique children’s dishes feature the alphabet, bible sayings, and fictional storybook characters. Nineteenth century companies found a vast source of designs from the popular books of the day, Mother Goose being one of the most popular. These plates were also used as an educational tool for children; ABC plates were used for teaching the alphabet to a young child as they sat and ate their meal. Positive character traits were reinforced through the designs on some antique plates and mugs, especially kindness and politeness. Die Geschichte vom Azppel-Philipp ABC dish from the 1800s. 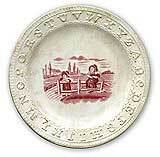 ABC Plate from the Mid-19th century with a raised alphabet border..
ABC dish with a colorful nursery rhyme scene from the 1890s. This ABC dish features a train and is labeled "Baby's Plate." This ABC dish is from the early 1900s. 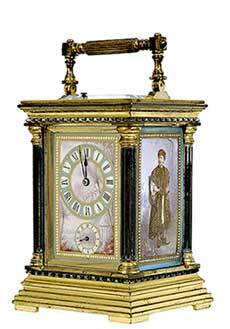 Hand-painting antique china was an easy and popular craft during the Victorian era. An easy project was decorating children’s dishes and drinking mugs with nursery rhyme characters or the alphabet. Whether recreating your own antique style children’s dishes or designing tiles for a Victorian nursery and bathroom, these illustrations will offer an opportunity to create a fun-filled craft.